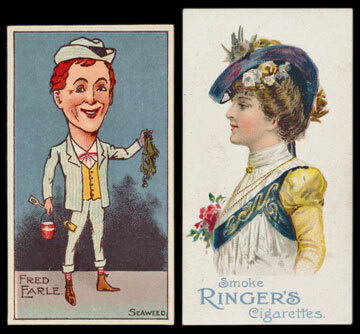 The cigarette card sale offered an excellent selection of collections and accumulations. The first section of the sale contained the accumulations and mixed lots and there were some excellent results with many exceeding their estimates. A lot containing sporting sets by Churchman, Gallaher, L & B, Ogdens and others was estimated at £350 and realised £590, a collection containing military sets by Gallaher, Ogdens, Phillips, Wills and others estimated at £320 realised over £500, a collection containing boxing and motor racing sets by Cope, Franklyn Davey, Ogdens, Player, Cummings and others was estimated at £250 realised nearly £500 and a collection in old albums with sets by Ogdens, Phillips, Players and others estimated £120 realised £520. There were some high quality individual sets up for grabs. The highlights were a Clarke Royal Mail set realising £212 against an estimate of £120, a Cohen Weenen Star Artistes set estimated at £200 realised over £280, a collection of Ogdens Guinea Gold cards estimated at £400 made £590, a Player Old England’s Defenders set estimated £220 realised nearly £380 despite some cards having corner marks, a Taddy Klondyke Series set in very good condition realised over £400 and a Wills Our Gallant Grenadiers set estimated at £180 made £270. American cards were well represented in the foreign cards section of the sale and some excellent results were achieved. A collection of type cards by Allen & Ginter, Duke, Gail & Ax, Thos. Hall, Kinney and others estimated at £400 realised nearly £750, a lot containing complete and part sets by American Tobacco Co., B.A.T. and others made £1,000 against an estimate of £350 and a collection of complete and part sets by Allen & Ginter, American Tobacco Co. and B.A.T. estimated at £220 realised £590. Individual sets also did well with a B.A.T. Indian Chiefs set in good to very good condition estimated £120 made £177 and a Kimball 1895 Beauties with Playing Card Insets set realised £885 despite one having a crease. As ever there were many attractive trade card lots on offer. 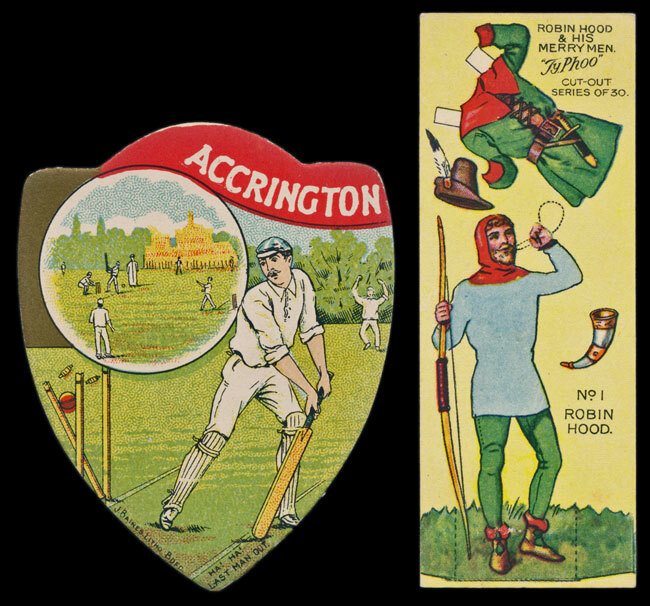 Three lots containing Baines die cut cards all did exceptionally well with the first one containing 101 Rugby cards realising over £1700, another with 29 Football cards making £460 and a range of 15 Cricket cards realising £470. Other highlights included a Chix Famous Footballers 3rd Series set making £212, a collection of Liebig cards estimated at £250 realised over £430, a Primrose Confectionery Yellow Submarine part set of 43 cards estimated at £70 realised £212, a Typhoo Robin Hood and His Merry Men set made nearly £180 and a Whitbread Inn Signs Portsmouth set estimated £70 realised £118. Our next auction is on Wednesday 24th January 2018. We will again be offering an excellent selection of collections and mixed lots alongside an array of British and foreign cigarette card sets. 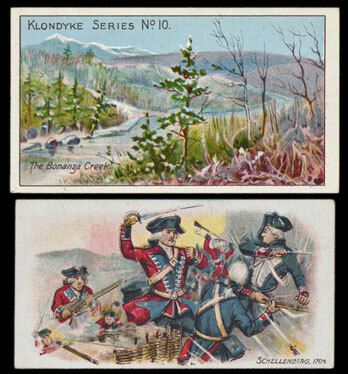 The Trade card section will be particularly strong with an outstanding collection of A.& B.C. Gum cards, Anglo Confectionery sets and many others on offer. Not to be missed.